Hardwood Flooring Trends in Cedar Rapids. Traditionally the hardwood floors of choice have been narrow strip flooring, and that was a sensible decision for around Cedar Rapids’ humid cornfields, (narrow strips are more stable than wider planks). 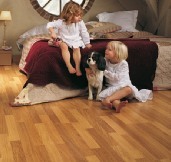 So when people choose laminate flooring sometimes they will be drawn to what they know and choose the 3 strip designs. Like this. However it doesn’t have to be this way anymore, Engineered hardwood flooring, bamboo and laminate flooring can be in wider planks without affecting the stability of the floor. People are welcoming this new look of flooring. The wider planks are less busy and more contemporary. So if you don’t want the traditional look then be brave and opt for a wider plank, if you’re feeling particularly brave then make a statement with your floor. I install a lot of dark floors and I’m always impressed with that darker look which always looks more luxuriant. I still think people often get confused with the term hardwood and softwood. Just to add to the confusion I now hear a lot of people referring to laminate flooring as Hardwood flooring. Hardwood flooring: is flooring where at least the very top layer is from a tree with leaves. Hardwood flooring can be solid or engineered. Hard wood is wood that is hard, soft wood is wood that is soft. Its easy to see the difference between hardwood and hard wood when its written down. So when I’m asked to quote for a hardwood floor I know that could include, engineered hardwood, bamboo or even laminate flooring. I also know that sometimes people call floating vinyl flooring laminate flooring. V groove or flush laminate flooring? On cheaper laminates can be a way in for moisture. I would just like to thank the reviewers for taking the time to write and post reviews. I always welcome any feedback and reviews. Can I do my own tearout? What hardwood trends do you see in Cedar Rapids? V-groove or flush laminate flooring? Yes, you can remove carpet, hardwood, vinyl, and tile. Hallways, bathrooms and kitchens can be more difficult if your flooring is under doors, toilets, cabinets and heavy appliances. Your knees may be in good shape but if you kneel on a one-legged staple you’ll know about it so wear some kneepads, eye protection and cut resistant gloves. Expect some dust. Your subfloor may have fine drywall dust on it which walks everywhere. If vacuuming doesn’t remove all the dust you can mop away or seal this dust with a mixture of white wood glue and water. If you want to re-use your baseboards, then its best to remove carpet first then remove baseboards. First “un-install” the carpet, start in a corner and pull with pliers, releasing it from the tack-strips, release the carpet all around the perimeter. I cut up carpet into manageable strips 3’ to 4’ wide, roll them and tape the rolls which makes the carpet easier to carry. Its far easier to cut the carpet from the back so if you can, fold it over in sections. The underlay/pad is normally stapled or glued to the floor, you can release it by hand or use a square spade or heavy duty driveway ice scraper. Sometimes the pad just disintegrates so a shovel is handy to scoop it up. I roll this up and tape it leaving one length of pad to wrap up the evil tack-strips. Tools: Electrical tape, small pry bar, sharp wide chisel, circular saw. First remove anything on top of the laminate, base-boards, quarter round, and thresholds. Glueless laminate is easier to remove and can be unfolded from a free wall towards the door. You can stamp/kick boards out from under obstacles. If you have no free wall or you don’t want to disturb the baseboards then pick a seam in the center of the room and drive a chisel through it, once through you can pry a board out/destroy a board). Once you have one board out its easy to pry/destroy a full line. Once you have taken out a complete line its now possible to fold out the remaining planks. Glued laminate is sometimes best to cut into big squares 5’x5’ using a circular saw set to the flooring thickness. The big panels are an easy way to move a lot of laminate in one trip. Laminate flooring is easier to carry and load if its stacked and taped together in manageable piles. Tools: Small pry bar, large pry bar, sharp wide chisel, circular saw. If your base-boards have been installed over your hardwood floor, then they will have to be removed before the hardwood is removed. Glued down hardwood is easier to remove if it cut into sections first. Tools: Small pry bar, large pry bar, sharp wide chisel, circular saw, toekick saw, multitool, reciprocating saw. Vinyl flooring is usually glued to an underlayment which in turn is stapled to the subfloor every 4” and every 2” along the seams of the underlayment. Coupled with the fact that its likely to be in the kitchen or bathroom with cabinets built over it makes removal difficult. Using a circular saw set to the thickness of vinyl and underlayment, cut into 3-5’ square sections. Pry up each section. Remove staples. If your kitchen is built on top of your vinyl floor you’ll have to cut through the vinyl and underlayment all the way round I use a toekick saw (dangerous but quick) a multitool and reciprocating saw. Tools: Hammer, chisel, SDS hammer drill, small pry bar, large pry bar, tile saw, toekick saw, multitool, shop vac. If cabinets are built on top of tiles, then the tiles will need to be cut using a toe kick saw and diamond blade. Tools: Pliers, boxcutter/carpet knife, electrical tape, 24” pry bar, small pry bar. Carpet on stairs is easy to remove, start at the top and using pliers loosen an edge, once you have an edge to hold on to you can just tug the carpet free from the staples and tack-strips. There’s lots of evil tack-strips and staples so gloves are essential. You should end up with 2 to 4 pieces of carpet. Remove the pads by hand. Remove the tackstrips with a pry bar, you can wrap them up in a section of carpet. There will be lots of staples to remove. Remove base-boards with a wide sharp thin pry bar. Only pry against the wall where there is a stud or low down below the top of the baseboard to prevent damaging your drywall. Be careful on exterior corners to try and pry baseboard away from the corner drywall bead. Pull the nails out from the reverse or wiggle them till they break off. Label them with the room they belong to if your project is over many rooms. Small sections of baseboard are easily lost or broken so you can leave them in place. If a baseboard is broken there’s a good chance I can glue it back together so don’t throw it away. I can also replace broken baseboard by using baseboard taken from the closets and in turn use new (possibly unmatching) base-boards in the closet. Some staples come out easily, some are more challenging. I use a lot of different tools in waves as there’s not one tool or technique that works with every staple. If staples are completely flush with the subfloor then there’s no point digging them out unless they are in a hardwood floor which is about to be refinished. There are 2 types of staple used in flooring, wide staples used for underlayment/pad and narrow crown staples for carpet, vinyl underlayment, and tackstrips. Wide staples an often be easily removed by hitting both legs with a pry bar or scraper. Occasionally they’ll release on one side only, if this happens you can fold them down onto a pry bar, then holding them onto the prybar pry them out, or use your pliers.